The first four tales feature the manuscript, the sign, and the specter of the titular character. America is in a state of peace. Living in the security of a militarized state, it has legalized suicide. However, a manuscript threatens the sanity of Hildred Castainge. Hildred, recently released from a mental institution after a fall from his horse, tries to cope with his life. 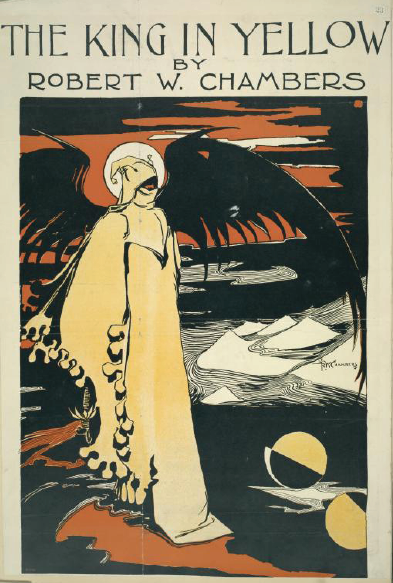 A bizarre story, which sets up the universe for the King in Yellow stories. Chamber's alternate history is as curious as it is unsettling. For all its pronouncements of peace, it shows a zealously militaristic and nationalistic U.S. Our unreliable narrator may be to blame as he interacts with the repairer of reputations. A great start to the set. Boris shows his friend Alec his new method of instant fossilization when he creates a stone lily. The friends are sculptors finishing up pieces for a show. Alec recently admitted his love to Genevieve, but was rejected in favor of Boris. The friends made up, but something is still nagging at the trio. This one had a few twists and turns. It is not a standard love story, nor does Chambers fall into the trap of repeating his initial story. The King in Yellow elements make a very minor but significant appearance in this tale. A man sits in church distracted by the sound of the great organ that is interrupting the lovely service.The narrator has found his mind filled with hateful thoughts since he read The King in Yellow. As the organist leaves the man feels relaxed, but soon he sees the organist leaving, yes again, as the man sinisterly glares at him. 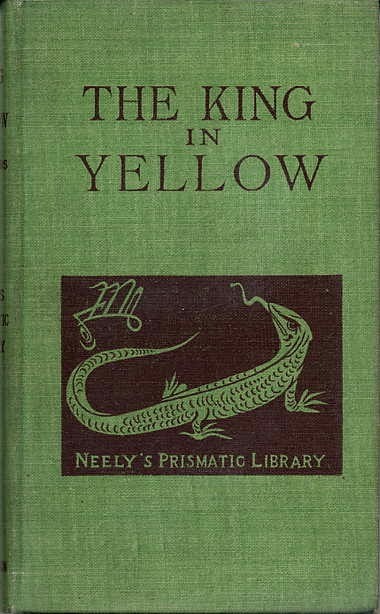 Another profoundly weird tale and the only appearance of the legendary King in Yellow. Though strange, this tale is a simple one. The key points are the atmosphere it builds and the harrowing final line. An artist paints his model when he notices an obese man outside. He returns to his painting and finds it tinged with a sickly green tint. The more he tries to remove it, the more it spreads. Finally, he gives up on the painting and his model tells him of a strange dream she had where he lay in a coffin drawn by the fat man. The yellow sign has some great imagery, but the story is similar to The Repairer of Reputations. The affects of the King in Yellow manuscript and the Yellow sign are both more oblique and more abrupt, leaving the ending more jarring than the previous stories. The stories after this one aren't really horror stories. A man falls asleep among some forgotten moors. He awakens to find a woman reacquiring her falcon and its prey. He asks her if there's a way out and she suggests that it takes longer to get out than get in. He decides to return to her estate and meets her anachronistic household. The description of falconry lends realism to the world and the pride the woman has for it tells a lot about her. This tale is likely not for everyone and the ending is a bit cliche, though it does provide solid characters and a look back to a simpler time. Several mini-stories that mirror lines and tell a sort-of story. This is why I don't review poems. This is an interesting experiment that succeeds in being weird, but doesn't quite make it to creepy. A cat wanders into an old man's shop, so he pets her. As he pets her, he notices a garter around her neck and begins thinking about the woman to who must must belong. This one is pleasantly macabre with just the right feeling of tenderness. People struggle with their lives amid war-torn Paris streets. A secret emerges between two lovers that threatens to tear them apart. An okay story that is very Parisian. There is some gorgeous imagery. The last three stories are based on Chambers' experiences in Paris as a young man. A Parisian man introduces his American friend to the lovely Valentine. They hit it off, but there remains something barring their relationship. An incredibly French tale of romance and complications. A young American abroad hears about a gorgeous girl that all the guys are in love with. He forgets about her until he notices a beautiful woman on the street. Another classic tale of love abroad that has been told many times and many ways. This version is good with beautiful description as is typical of these tales. If you're just looking for something scary, stop at the first three tales. However, if you like the style and want to read something different by Chambers, check out the whole collection. The transition between horror and more grounded fare can be a bit jarring, even with the transition pieces in the middle. 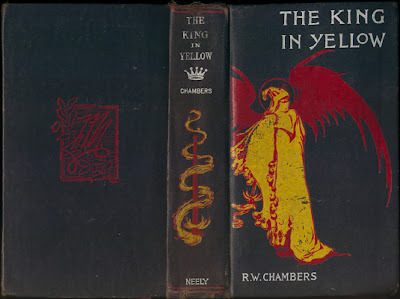 Be sure to read at least the King in Yellow stories if you're a horror fan. Get it free in Project Gutenberg and Kindle!